Celebrating the life of Fred Grady Chapman, Jr.
Be the first to share your favorite memory, photo or story of Fred. This memorial page is dedicated for family, friends and future generations to celebrate the life of their loved one. Obituary for Fred Grady Chapman, Jr.
served on the US Destroyer, Chevalier. After the war he went to work for Lathem Time Recorder Company in Atlanta. working at Lathem he met Lenora Hughes. 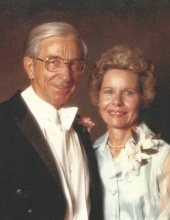 They were married on New Years Eve 1953.
both loved. Their favorite vacations involved train trips aboard Amtrak. Fred’s favorite sport from a young age was throwing horse shoes and he was good. with good health and remained active until the very end of his life. Fred is survived by his three children, Necia and Terry Silvers, Fred and Carol Ann Chapman and James and Donna Chapman, thirteen grandchildren, and fifteen great grandchildren. A funeral service for Mr. Chapman will be held Monday, January21, 2019 at 2:00 PM in the chapel of A.S. Turner and Sons Funeral Home and Crematory. The family will receive friends one hour prior to the service at the funeral home. Due to the National Holiday, Interment will be Tuesday, January 22, 2019 at 10:00 AM at Melwood Cemetery. To send flowers or a remembrance gift to the family of Fred Grady Chapman, Jr., please visit our Tribute Store. "Email Address" would like to share the life celebration of Fred Grady Chapman, Jr.. Click on the "link" to go to share a favorite memory or leave a condolence message for the family.